In a garden, Leonardo walks with his mother, Tang Shen. Leo is confused and worried that he lost something important but cannot remember what it was. Tang Shen soothes him and hands him a blossom as a reminder of her love for her son. In tears, Leo awakens from his meditation, gripping a blossom in his hands. Outside a liquor store, in broad daylight, Angel faces down a pair of robbers. She knocks one out, but the other pulls a gun. Luckily, Raph shows up and makes short work of the thug. Angel is worried, as the city’s crime is escalating in the wake of the recent gang wars. Raph asks Angel if the Purple Dragons could assist his family in an important matter. Angel says that she doesn’t have as much sway with the Dragons as she used to, but promises to lend a hand herself. Elsewhere, Mikey sneaks up on his pizza delivery friend Woody. Woody and Mikey make amends and go back to being buds. Mikey asks Woody if he’s heard anything about the recent gang activity. Woody doesn’t know much, but names a few places in the city too dangerous for him to deliver pizzas in. Meanwhile, Don and April go to visit Harold Lilja in his high-tech (and highly secret) new lab. Harold is reluctant to let April in, but she wins him over with her techno jargon. Inside, Don asks if he could borrow some of Harold’s anti-gravity gauntlets and other assorted tech. Harold tells Don that he’s been making upgrades, but hasn’t tested them, so to be wary. At Savate headquarters, Victor gives his men an impassioned speech. He’s interrupted by Shredder, Dark Leo and a swarm of Foot Soldiers who come bursting through the window. As the Foot get Victor on the run, Leo radios Karai and tells her to wait for his signal to begin her secondary attack. 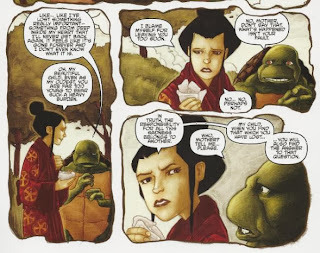 Karai acknowledges, but then immediately leads her unit of Foot Soldiers to battle (much to Alopex’s concern). Outside Stockgen, Old Hob assigns Splinter his “good faith” mission: To steal some mutagen so Hob can make his mutant army. Splinter reminds Hob of their deal and infiltrates the facility, locating the mutagen. A security guard briefly delays him, but Splinter reluctantly knocks him out. Back at Savate HQ, Leo and Victor square off. Victor puts up a good fight, but Leo proves victorious. Leo’s about to kill Victor when Shredder intervenes, saying he has plans that require Victor to be taken prisoner. 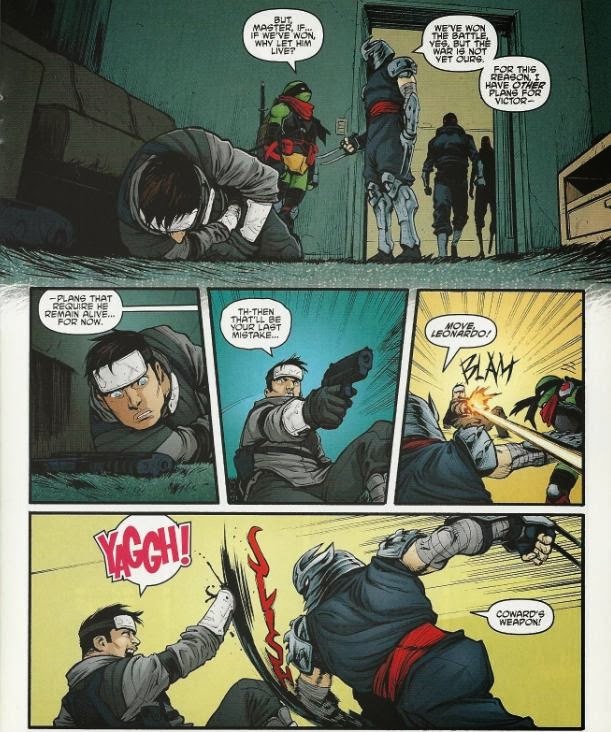 Victor pulls a gun and Shredder shoves Leo out of the line of fire, then slices Victor’s right hand off. Foot Soldiers bind his wounds and carry him away. At the hospital, Raph pays a visit to Casey. Raph apologizes for letting Casey get injured, but Casey won’t hear it. He knows Raph did all he could and no one’s to blame. Casey asks how things are going with Raph’s family, and in addition to Leo, Raph’s also worried about the trouble Splinter is getting himself into. Speaking of whom, Splinter escapes Stockgen with the mutagen and gives it to Hob. Hob promises to honor their deal to find Leo and Splinter leaves. As soon as Splinter is gone, Slash returns from planting explosives all over Stockgen. Hob promises the Evil Turtle “no more pain” and then blows the facility sky high. At Savate HQ, the Foot Clan is cleaning up the mess. Karai eavesdrops on Shredder telling Leo that this is only the beginning. Karai mumbles to herself that this is true. *This story is continued from TMNT (IDW) #25. 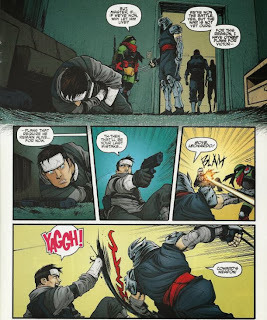 The story continues in TMNT (IDW) #27. *TMNT Villains Micro-Series #7: Bebop & Rocksteady takes place between this and next issue. 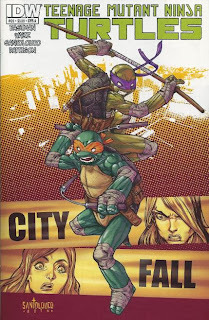 *Angel lost command of the Purple Dragons to Hun in TMNT Villains Micro-Series #6: Hun. *Woody told Mikey they’d better not hang for a while back in TMNT (IDW) #16. *Don befriended Harold Lilja back in TMNT Micro-Series #3: Donatello. *This issue was originally published with 5 variant covers: Cover A by Santolouco, Cover B by Eastman and Pattison, Cover RI by Kris Anka, Cover RE Jetpack Exclusive by Eastman, and Cover RE Jetpack Exclusive Leonardo bandana. We’re into the second half of “City Fall” and the myriad plot threads are starting to come together. Oddly, the big gang war between the Foot and the Savate ends on something of a whimper rather than a roar. The Foot wipe the floor with the French ninja gang in short order and thus that conflict is quelled. So is that… it? The whole gang war that characters have been muttering about in hushed tones for the past 5 or 6 issues? Man, I hope not. That aside, this was a nice issue of “catch up” for the characters and a refresher course on what allies the Turtles have getting their backs. Raph shoots the breeze with Angel and Casey, Don and April remind us all that Harold still exists, Mikey bums some chow off Woody, and Splinter earns his alliance with Old Hob and Slash. I thought it read pretty well and it's cool to see some of these forgotten faces again. Harold could make for a fun recurring character if they’d utilize him more often. The Donatello Micro-Series was one of the highlights of that first volume and Harold was an amusing character (though I’ll admit he’s probably better off in small doses). Woody… well… The guy had BARELY even been in the book before he got written out after the “Blood Brothers” arc, so his departure didn’t really carry a lot of emotional weight. Likewise, his big comeback falls equally flat. 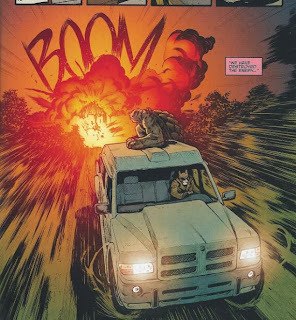 But at least now that he’s back in the book maybe we can spend a little more time getting to know him, or more importantly, getting to actually SEE this eternal bromance between him and Mikey we’re constantly told about but rarely shown. So far Woody’s still kind of a blank slate, but that just means he has nowhere to go but up if the writers choose to develop him. The subplot that got me the giddiest (wow, that’s a real word? I don’t think I’ve ever typed it before) was Splinter’s theft of the mutagen for Hob. We’re finally going to start getting that mutant army and I’m pumped to see who joins the party. Will there be any familiar faces? Will it be nothing but new characters? Dunno, but I’m psyched. This is another of those long simmering plot threads that I’m chomping at the bit to see pay off. Hob’s really growing as a character, too. He’s no longer the petty thug he used to be and, while not even close to a “nice guy”, seems perfectly willing to enter into “you scratch my back, I’ll scratch yours” deals… and honor them! The whole thing with Splinter is obvious, but here he fulfills his promise to Slash for “no more pain” and destroys Stockgen (which likely also gives him a bit of petty revenge pleasure, too). Hob is starting to hit that desired grey area where he’s evil, but you can’t help but like him a little, too. Slash is still a dummy, but maybe now that Stockgen is behind him and he’s made new friends he can start to develop beyond “monosyllabic brute”. Now that we’re in the back half of the story arc, I’m expecting it to pick up a little. While I was let down by Victor and the Savate’s easy defeat (not much of a “gang war”, was it? ), other plot threads are commanding more of my interest. I enjoyed the “roll call” aspect to this chapter and hopefully it means some of these lesser characters will get more facetime in the future, now that we’re reminded they all still exist. The opening dream with Tang Shen was very bittersweet and that’s another thing I hope to see explored more in the future: The Turtles and their relationship with their mother. I totally agree, my only complaint with this issue is also the usual incompetence of Savate. I'm really looking forward to seeing familiar characters, and after this issue I'm now hoping maybe even Woody will also become someone we already know from some TMNT universe - probably not too soon though. I didn't really think of anyone in specific yet (we know now it's not Pizzaface - unfortunately :) ). Dude, Shredder just chops off some guy's hand. Pretty brutal. And this is the best Shredder EVER.